A couple of months ago I went over what a twenty year investment in Exxon Mobil would have looked like. The big point touched on at the start of that piece was that, as an asset class, energy was the standout performer in terms of returns between the early 1990s and 2013. Even though the recent oil price crash has hit the mega-cap oil stocks pretty hard, you can still easily see how well Exxon Mobil and Chevron have done over the last couple of decades just from their share prices. Even in the midst of this severe downturn Chevron’s stock price is $101 a share compared to the $30 a share it was at twenty years ago. We also know that Exxon Mobil has delivered pretty strong returns over the last couple of decades. The third stock of the big three is Anglo-Dutch giant Royal Dutch Shell, which just so happens to be the single oil & gas stock that made Jeremy Siegel’s twenty best performers list in his book, The Future For Investors. The study covered the early 1950’s up to something like 2003 (missing the mega oil bull market that followed), so it’s not clear whether it would still hold that distinction, but the interesting thing is that Shell is the oil major that’s been hit with the dead money stick over the last fifteen or so years. Chevron and Exxon Mobil have seen share price growth of somewhere in the order of 7% a year. In the case of Royal Dutch Shell the stock price has gone absolutely nowhere since 2000. At the turn of the millennium investors were paying $55 for a Shell ADR (two ADRs equal one underlying share). As of today they are paying $52. There’s no doubt that is a disappointing performance for a stock that spent the previous fifty years compounding at a rate of about 13.5% per annum, though the headline figure does ignore what Shell pays out in dividends. For example, since 2006 it has distributed $33.26 per share in dividend payments – equivalent to about 50% of the stock price in the early parts of that year. In the context of a high dividend yield you might be thinking that a stock price that goes nowhere makes sense. As a shareholder you will see little returns from capital appreciation, not altogether surprising given the sheer size and maturity of the company, but this is compensated for with a large dividend yield that comprises the majority of the total return. As it turns out since 2006 that equated to a compounded annual return of only 3% (assuming dividends were reinvested) because of the poor share price performance. In fairness this covers a period in whicj the price of oil went from well over $100 per barrel to $50 per barrel, hitting a cycle low in the process of about $27 per barrel earlier this year. The thing is though that Shell has consistently had a large dividend yield throughout its history, and it is this point that has contributed to it being on the list of the twenty highest performing stocks. In effect it’s another way of saying that the company had been perpetually undervalued throughout the second half of the last century. 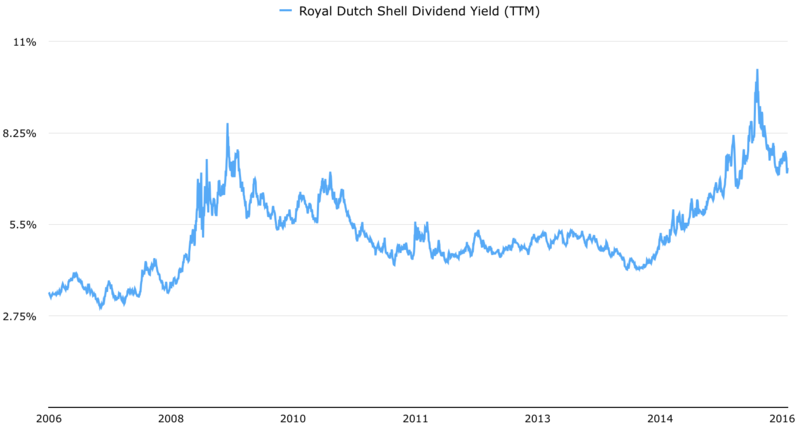 While high growth stocks were being priced with full consideration of future profit growth potential, high yielding stalwarts like Royal Dutch Shell were being overlook as boring dividend stocks. Meanwhile every year you were treated to a large dividend yield plus modest growth in production and commodity prices. When reinvested those dividends were enough to turn a $1,000 investment made in the early 1950s into over $400,000 by the early 2000s. Even after adjusting for inflation those are astonishing returns. Today you have a stock that at the peak of the oil price cycle was trading at $85 per share with a $3.76 per share dividend. In the first quarter of this year the shares hit a cycle low of $41 on the same $3.76 dividend. That was giving you a yield of 9% on a stock that hasn’t had a dividend cut in the last seventy years. Granted, it reflects the inherent risk that the distribution will be cut, but even in 2017 that dividend is still expected to be within the level of net profit generated by the company. Following the recent rally in oil stocks the dividend yield is still over 7%. That means that, with those dividends reinvested, you will own about 14.5% more shares by the end of 2017 than at the start of the year. 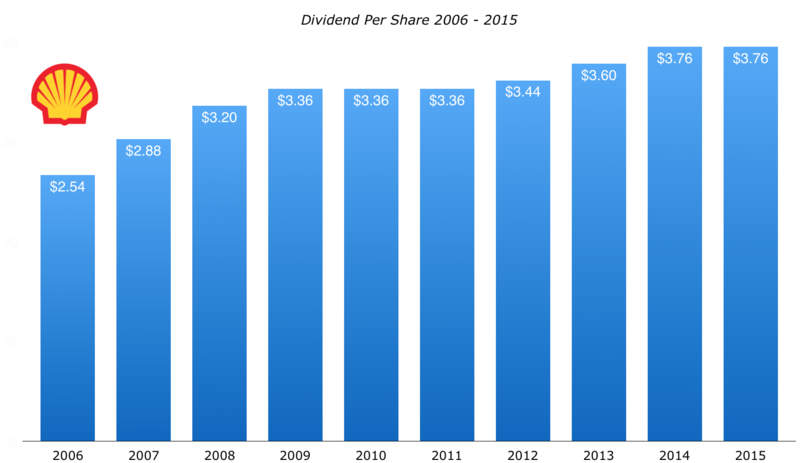 Think of the dividend income that will throw off when oil prices recover. It’s painful to go through, but you have to be prepared to stick through downturns and reinvest those high yield dividends when the stock is flagging. History shows that it pays off in the decades that follow.